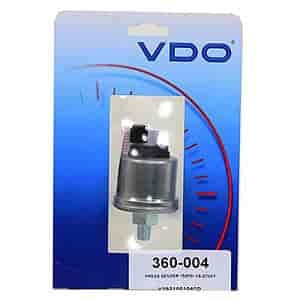 VDO Pressure Senders are designed to work with VDO gauges only. They're matched to gauges according to the maximum reading on dial faces. Unless otherwise noted, senders are 10-180 ohms and standard ground (sender case to common ground). Floating ground indicates the presence of an additional terminal to be used as a ground (isolated terminal to common ground). VDO senders have tapered threads: DO NOT use PTFE tape or pipe sealant, as this will interfere with grounding. 360-004 is rated 5.0 out of 5 by 1. Rated 5 out of 5 by debogdon from Replacement Pressure Sender Was Able To Use Data In Online Catalog To Match Replacement Unit To Old One. "You Had It, Shipped It, I Got It, Installed It, It Worked!, What Else Do Ya Want"